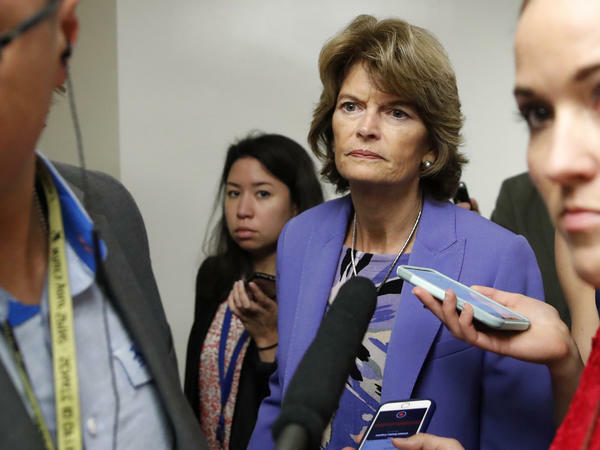 Sen. Lisa Murkowski, R-Alaska, is one of the senators who have not announced a decision on Brett Kavanaugh's nomination to the Supreme Court. "This whole two-week effort has been a calculated and orchestrated political hit," he told the committee. He said it was funded with "millions of dollars in money from outside, left-wing opposition groups." Since July, when President Trump nominated Kavanaugh, the warring advocacy groups have spent some $10 million on TV ads either assailing or praising him. Advocacy organizations on both sides are able to keep donors' contributions secret. But spending on TV advertisements must be disclosed to the Federal Communications Commission, and by that measure, the conservative groups are spending more than the liberals. The sharpest attack so far may come from the American Civil Liberties Union, which abandoned its policy of not endorsing or attacking candidates in order to challenge Kavanaugh. The ad uses quick edits to tie Kavanaugh to President Bill Clinton, who was impeached for lying about his Oval Office affair with Monica Lewinsky, and comedian Bill Cosby, now in prison for sexual assault. The ACLU introduced the ad this week, with a million-dollar ad buy in Alaska, Colorado, Nebraska and West Virginia, the home states of two undecided senators — Lisa Murkowski, R-Alaska, and Joe Manchin, D-W.Va. — and two whom the ACLU hopes to sway — Republicans Cory Gardner of Colorado and Deb Fischer of Nebraska. The conservative Judicial Crisis Network almost simultaneously launched an ad saying, "The liberal mob and their media allies tried to ruin a good man with smears," while Kavanaugh "fought back, clearing his name." The spot is running in West Virginia and North Dakota, home of Democratic Sen. Heidi Heitkamp, who, along with Manchin and Sen. Joe Donnelly, D-Ind., is both uncommitted on Kavanaugh and seeking re-election next month. "A little over $4 million has been spent running ads in just those states," said Douglas Keith of the Brennan Center for Justice at New York University law school. The center has been tracking TV ad spending on the Kavanaugh nomination. Keith said there is another $2 million being spent in Maine, home of undecided Republican Sen. Susan Collins, and about $500,000 to reach Murkowski in Alaska. He noted that none of the targeted states have high-cost media markets. "Especially when you're looking at states like North Dakota and Alaska," Keith said, "this is really an incredible amount of spending." So since President Trump nominated Judge Brett Kavanaugh to the Supreme Court back in July, advocacy groups have spent a whole lot of money, nearly $10 million, on these warring TV ads for and against him. Now the attacks - and the spending - are fiercer than ever. Here's NPR's Peter Overby. PETER OVERBY, BYLINE: The sharpest attack so far may come from the American Civil Liberties Union, which opposes Kavanaugh. The ACLU rolled out the ad this week with a million-dollar buy in four states. BILL CLINTON: I did not have sexual relations with that woman. BILL COSBY: I've never seen anything like this. BRETT KAVANAUGH: I categorically and unequivocally deny the allegation against me by Dr. Ford. OVERBY: Then-President Bill Clinton, comedian and convicted sexual assailant Bill Cosby and Kavanaugh at a Senate hearing last week, where he denied committing sexual assault back in prep school. That ad came out within hours of this one from the conservative Judicial Crisis Network. UNIDENTIFIED PERSON: The liberal mob and their media allies tried to ruin a good man with smears. KAVANAUGH: You have replaced advice and consent with search and destroy. UNIDENTIFIED PERSON: Judge Kavanaugh fought back, clearing his name. OVERBY: At the hearing, Kavanaugh described the allegation against him this way. KAVANAUGH: This whole two-week effort has been a calculated and orchestrated political hit. OVERBY: And he said he knew how it was funded. KAVANAUGH: Millions of dollars in money from outside, left-wing opposition groups. OVERBY: In fact, there's money flying every which way in the Kavanaugh confirmation battle. It comes from advocacy groups that can keep their donors secret. The thing that can be traced is TV spending. And the Brennan Center for Justice at New York University law school has been tracking the Kavanaugh TV ads. The center's Douglas Keith said both sides are focusing their ads on three Democratic senators who are up for re-election next month, Joe Manchin in West Virginia, Joe Donnelly in Indiana and Heidi Heitkamp in North Dakota. DOUGLAS KEITH: A little over $4 million has been spent running ads in just those states. OVERBY: There's $2 million more being spent in Maine, home of undecided Republican Senator Susan Collins, and about half a million in Alaska, home of another uncommitted Republican, Lisa Murkowski. Keith said these are not high-cost media markets. KEITH: Especially when you're looking at states like North Dakota and Alaska, this is really an incredible amount of spending. OVERBY: The Brennan Center data show that when it comes to TV, there are many more conservative groups than liberal ones. And conservatives are spending most of the money. (SOUNDBITE OF EPIGRAM'S "THE STRANGERS WE ARE BECOMING") Transcript provided by NPR, Copyright NPR.